Photo of U.S. Capitol by Flickr user UlisesJorge via Creative Commons. 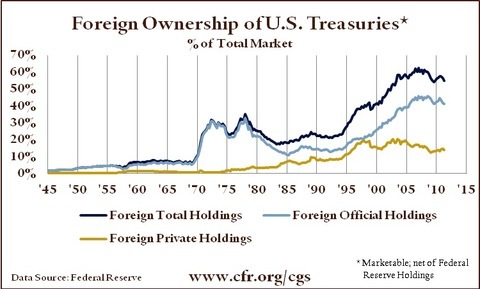 The U.S. Treasury has borrowed trillions of dollars over the past decade, much of it from foreign investors, to help finance two long wars, rescue its financial system, and promote economic growth via fiscal stimulus. The country’s ability to borrow is restricted by statute, and Congress has perennially been called upon to authorize the issuance of new debt space. However, the federal government reached its borrowing capacity of $16.39 trillion in December 2012, and, in the absence of new borrowing authority from Congress, Treasury is taking extraordinary measures to meet its financial obligations. The United States has always been able to raise its debt limit in a timely fashion, and many economists assert that a failure to do so in early 2013 would plunge the government into default and precipitate an acute fiscal crisis. 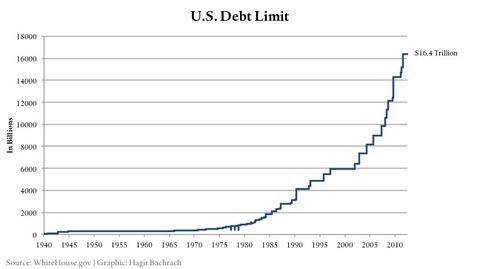 What Is the U.S. Federal Debt Limit? The government must be able to issue new debt as long as it continues to run a budget deficit. 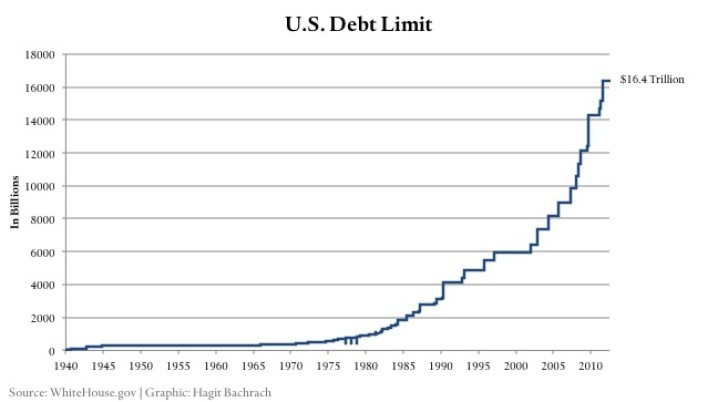 The debt limit, or “ceiling,” sets the maximum amount of outstanding federal debt the U.S. government can incur by law. As of January 2012, this number stands at $16.39 trillion. Increasing the debt limit does not enlarge the nation’s financial commitments, but allows the government to fund obligations already legislated by Congress. Hitting the debt ceiling would hamstring the government’s ability to finance its operations, like providing for the national defense or funding entitlements such as Medicare or Social Security. Under normal circumstances, the government is able to auction off new debt (typically in the form of U.S. Treasury securities) in order to finance annual deficits. However, the debt limit places an absolute cap on this borrowing, requiring congressional approval for any increase (or decrease) from this statutory level. A debt limit was instituted with the Second Liberty Bond Act of 1917, and Congress has raised the cap more than seventy times since 1962. Some analysts contend that by requiring legislative consent, the debt limit affords Congress some oversight authority and engenders some fiscal accountability. Historically, opposition parties have often used debt-limit negotiations to protest existing policies. How Was the Limit Last Raised? The debt ceiling was last raised as part of the Budget Control Act of 2011, a bill signed by President Obama in August of that year, just hours before a government default. The last-minute legislative compromise set forth a process by which Treasury’s borrowing capacity would be increased by a total of $2.1 trillion in three increments: by $400 billion in August 2011, $500 billion in September, and $1.2 trillion in January 2012. The deal also placed caps on all discretionary spending through FY 2021 and created an ill-fated bipartisan group of lawmakers known as the “supercommittee” tasked with identifying more than a trillion dollars in additional reductions. However, Congress failed to achieve the mandated savings and triggered automatic budget cuts at the end of 2012. A last-minute budget deal reached by Congress in January 2013 delayed the onset these cuts for two months. When Will the U.S. Hit Its Debt Ceiling? The Bipartisan Policy Center in Washington, DC, estimates the debt ceiling would have to be raised between $730 billion and $1.25 trillion, in order to extend the government’s ability to borrow through 2013. This increase would need to be between $1.3 trillion and $2.2 trillion to extend borrowing through 2014, according to projections. What Can the Government Do if the Debt Limit Isn’t Raised? The U.S. Treasury has the power take extraordinary measures to forestall a default–the point at which the government fails to meet principal or interest payments on the national debt. These include under-investing in certain government funds, suspending the sales of nonmarketable debt, and trimming or delaying auctions of securities. Congressional delay in raising the debt ceiling forced Treasury to begin taking some of these measures in May 2011 and again in January 2013. If Treasury is unable to issue new debt or take further actions to bridge the deficit, the government would be forced to default on some of its financial commitments, limiting or delaying payments to creditors, beneficiaries, vendors, and other entities. Among other things, these payments could include military salaries, Social Security and Medicare payments, and unemployment benefits. What Are the Implications for Financial Markets? Most economists, including those in the White House and from former administrations, agree that the impact of an outright government default would be severe. Federal Reserve Chairman Ben Bernanke has said a U.S. default could be a “recovery-ending event” that would likely spark another financial crisis. Short of default, officials warn that legislative delays in raising the debt ceiling could also inflict significant harm on the economy. 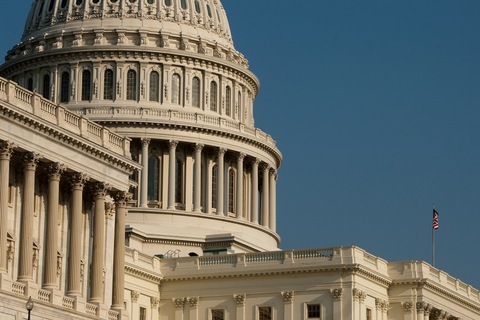 Many analysts say congressional gridlock over the debt limit will likely sow significant uncertainty in the bond markets and place upward pressure on interest rates. Rate increases would not only hike future borrowing costs of the federal government, but would also raise capital costs for struggling U.S. businesses and cash-strapped homebuyers. In addition, rising rates could divert future taxpayer money away from much-needed federal investments in such areas as infrastructure, education, and health care. The protracted and politically acrimonious debt limit showdown in the summer 2011 prompted Standard and Poor’s to take the unprecedented step of downgrading the U.S. credit rating from its triple-A status, and analysts fear such brinksmanship in early 2013 could bring about similar moves from other rating agencies. A 2012 study by the non-partisan Government Accountability Office estimated that delays in raising the debt ceiling in 2011 cost taxpayers approximately $1.3 billion for FY 2011. BPC estimated the ten-year costs of the prolonged fight at roughly $19 billion. The stock market also was thrown into frenzy in the lead-up to and aftermath of the 2011 debt limit debate, with the Dow Jones Industrial Average plunging roughly 2,000 points from the final days of July through the first days of August. Indeed, the Dow recorded one of its worst single-day drops in history on August 8, the day after the S&P downgrade, tumbling 635 points. What Are the Implications for the Dollar? 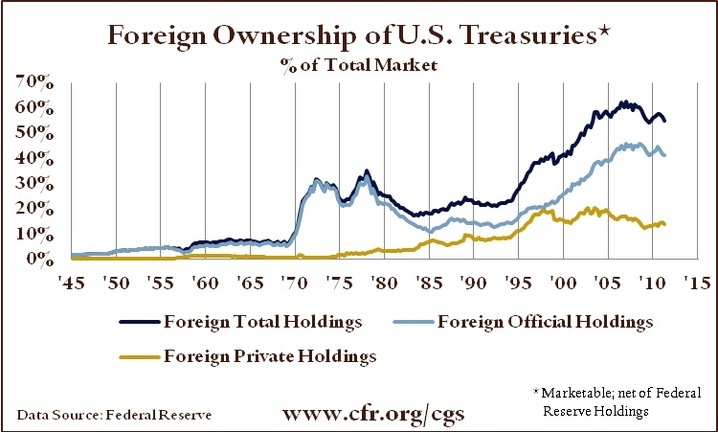 Historically, the U.S. Treasury market has been driven by huge investments from surplus countries like Japan and China, which view the United States as the safest place to store their savings. A 2011 Congressional Research Service report suggests that a loss of confidence in the debt market could prompt foreign creditors to unload large portions of their holdings, thus inducing others to do so, and causing a run on the dollar in international markets. However, others claim that a sudden sell-off would run counter to foreign economic interests, as far as those interests run parallel to a robust U.S. economy. While many U.S. exporters would benefit from dollar depreciation because it would increase foreign demand for their goods (effectively making them cheaper), the same firms would also bear higher borrowing costs from rising interest rates. A potential long-term concern of some U.S. officials is that persistent volatility of the dollar will add force to recent calls by the international community for an end to its status as the world’s reserve currency. A 2010 survey performed by the McKinsey Global Institute found fewer than 20 percent of business executives surveyed expected the dollar to be the dominant global reserve currency by 2025. Does a Federal Debt Limit Still Make Good Policy Sense? Many experts contend the federal debt ceiling is anathema to sound fiscal policy, suggesting it unwise to inhibit the government’s ability to meet financial obligations already legislated. “It serves no useful purpose to allow members of Congress to vote for vast cuts in taxation and increases in spending and then tell the Treasury it is not permitted to sell bonds to cover the deficits,” writes budget expert Bruce Bartlett. Bartlett has held senior policy roles in the Reagan and George H.W. Bush administrations and served on the staffs of Reps. Jack Kemp, R-N.Y., and Ron Paul, R-Texas. “No other nation has such a screwy system,” he notes. In December 2012, the White House proposed amending the law in order to grant the president greater freedom to raise the debt ceiling as needed. Under the proposal rejected by the GOP leadership, the president would have been empowered to effectively raise the limit unilaterally unless a two-thirds majority of Congress voted in opposition. How Does a Debt Limit Crisis Differ From a Government Shutdown? A shutdown takes place when Congress fails to appropriate funds for the current fiscal year, as last occurred in October 1995. In such a case, a specific set of procedures is enacted. A large portion of the federal government — work deemed “non-essential” — is suspended indefinitely and workers are furloughed without pay until funding is reestablished. A shutdown does not impede the government’s ability to pay interest or principal on its debt as long as Treasury has appropriate headroom under the ceiling. In other words, a shutdown does not precipitate a federal default. On the other hand, if Congress fails to raise the debt limit, the government can no longer borrow funds, but federal operations may continue for the period that Treasury is able to use existing revenue or secure additional resources through special measures. Therefore, most employees will continue to be paid, at least in the short term. However, Treasury’s continuing inability to borrow further capital would eventually lead to a default, assuming radical revenue increases or spending decreases are not instituted. Most experts agree that the potential negative consequences of a debt-limit debacle are much greater and far-reaching than that of a shutdown — particularly given the risk of a government default that would jeopardize the full faith and credit of the United States. The impact of a shutdown, while painful to the workers who are furloughed and the citizens who are temporarily denied certain government services, is limited to the symbolic message of political paralysis it presents to markets. The bipartisan Congressional Research Service provides a brief history of the federal debt ceiling, with a special focus on the budget debate over the last decade. A CFR backgrounder outlines the competing policy paths on fiscal reforms and the global consequences for failing to bring down U.S. debt. The U.S. Treasury attempts to separate fact from fiction with regard to the debt limit, including dispelling the notion that a federal default would bring consequences no worse than a government shutdown. This backgrounder was originally published by the Council on Foreign Relations.